This gorgeous necklace marks important events with a soldered diamond in spots of your choice. Inspired by a peaceful river current and the sunshine that dances across its rippled texture, this gorgeous necklace by Saundra Messinger carries a hidden message to remind you of your most treasured moments. Moved by memorable events in her own life, Saundra created this recycled sterling silver, matte-finished pendant as a representation of how she visualizes a year--a meandering, yet linear timeline, punctuated by moments that sparkle. This gorgeous necklace brings that concept to life, offering twelve notches to signify each month in the year. Important events are marked by a conflict-free bezeled diamond in a spot of your choice (up to three diamonds in one notch), so you can wear a personal reminder of weddings, births, and memorable milestones. After hand casting and finishing each pendant, Saundra drops your diamonds in their place, knowing that a special occasion or person is being honored and held close to your heart. A sweet and private way to commemorate special memories, you can add up to six diamonds, so your timeline can be as rich and lustrous as your own life. Handmade in New York City. For more styles from Saundra Messinger's Milestone jewelry collection, take a look at the Milestone Drop Necklace and Milestone Bracelet! 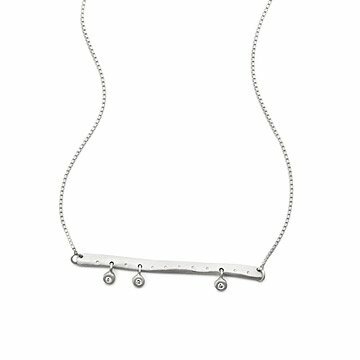 Saundra Messinger's Milestone Bar Necklace offers an elegantly abstract design that commemorates landmark dates such asweddings or anniversaries. Each arrangement of conflict-free, bezeled diamonds hung along recycled sterling silver, matte-finished bars represents a special date through a thoughtful, calendar-like concept and beautiful, natural materials. The Milestone Bar Necklace is packaged in a partially recycled, recyclable and compostable jewelry box. There's one place—and only one place—where you'll find the Milestone Bar Necklace: UncommonGoods.